Scrivener is a powerful writing program that lets you write the way you work best, whether that’s in one long, linear document, or a scattering of out-of-order scenes that you eventually knit together. These articles give you a quick overview of the Scrivener interface, along with a list of handy keyboard shortcuts. Menu bar: A collection of menus containing all of the commands available in Scrivener. Toolbar: The buttons on this bar are shortcuts for popular menu commands. Binder button: Click this button to view the Binder. Inspector button: Click this button to view the Inspector. Binder: Displays a hierarchical list of all the files in your project. Format bar: Contains shortcut buttons for common text and paragraph formatting commands. Header bar: Displays the title of the active document and provides shortcuts to several document commands. Inspector: Displays extra data about the active document. Editor: Where you view, write, and edit the active document. 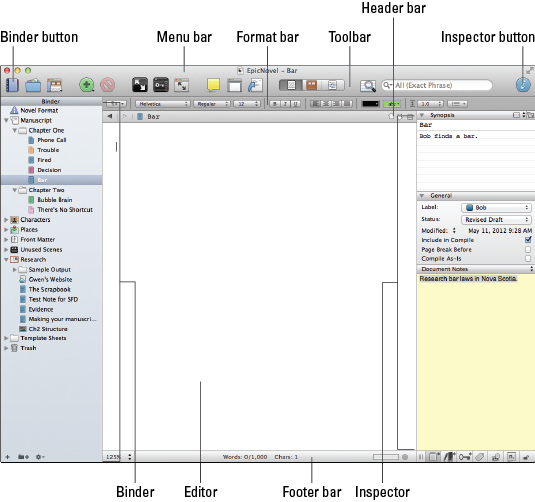 Footer bar: Provides additional information about the selected document, as well as shortcuts to several menu commands. Keep your hands on the keyboard with these Scrivener keyboard shortcuts, all of which allow you to navigate the interface and access helpful project commands. The keyboard shortcuts in this table give you quick access to some of Scrivener’s most helpful functions for working with files. Press these button combinations to make file changes, instead of clicking buttons on the toolbar or choosing options from the Scrivener menus. Work quickly when formatting or editing your documents in Scrivener by using the keyboard shortcuts in this table. Want to make some text bold without using the toolbar? Need to find something in the document? These shortcuts can get it done.